Austin Water regulates On-Site Sewage Facilities (a.k.a. septic tanks) located within the City of Austin full jurisdiction and areas annexed for the implementation of the Health and Safety Code. If you are not sure your property is located within the City of Austin's jurisdiction for OSSFs, you may enter your address in the OSSF Interactive Map provided below. Alternatively, you may use the Full Page Interactive Map. Please note that the interactive map works best using Firefox, Chrome, and Internet Explorer version 11. Whether your property is located within the City's jurisdiction for OSSFs. Whether your property is located within the Edwards Aquifer Recharge Zone or the Barton Springs segment. The City of Austin has been authorized by the Texas Commission on Environmental Quality to administer the On-site Sewage Facilities (OSSF) Program. The program falls primarily under the authority of TCEQ rules contained within 30 TAC Ch.285 On-Site Sewage Facilities. Permitting: Process permit applications and related fees for new and/or existing on-site sewage system. Complaint Investigation: Investigate exposed sewage and general public complaints related to OSSFs. Inherent to this activity are legal notices of violation and/or potential court action(s). Program Information: Address general customer inquiries, including system records' information requests, permitting and fee process inquiries, technical inquiries on types of systems and regulatory compliance questions. Fees are associated with all services provided and are reviewed annually during the City budget process. All fees are collected when applications for service are made and submitted. Additional fees may be required depending on specific aspects of an application or when permits have expired and are being reactivated or renewed. 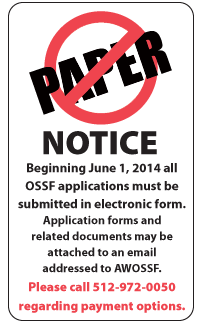 See a complete listing of OSSF Fees.